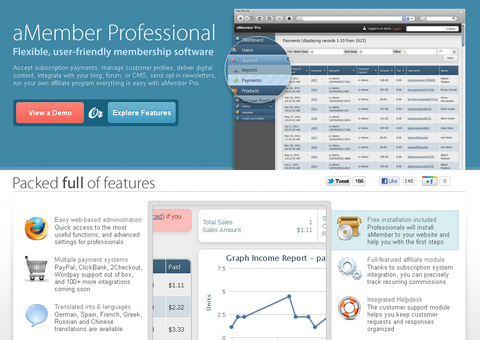 aMember Pro is membership/subscription software developed since year 2002. Within these 10 years, they have implemented more than 100 payment system and more than 120 third-party scripts integrations. New version 4 of aMember Pro combines fresh modern UI and CGI-Central’s long-term expertise in this area. aMember Pro accepts subscription payments, manage customer profiles, deliver digital content, integrate with your blog, forum, or CMS, send opt-in newsletters, run your own affiliate program everything is easy with aMember Pro. In this giveaway, 5 lucky readers will get aMember Pro worth $179.95 each which includes lifetime license with 6 months of free updates so you can start building your membership website immediately. Just leave a comment below on how you would use aMember Pro to build a membership website. We will pick 5 lucky readers and announce the results on 19th Feb 2012. Best of luck. i would prototype this system to work with our university’s old authentication system. I would build a WordPress theme house with this master tool. Loving your giveaway. I would use it to offer professional help in IT especially in education field, it will complement well with my already running brick and mortar shop. So I can expand easily and reach my would be customer. Thanks for the opportunity to win this. A business partner and I have a need for a membership backend for a new product of ours. aMember appears to be a best-in-class solution, so we’d love to win your giveaway. Thanks! What a brilliant product. I have been looking at amember for sometime now as my preferred choice to manage a subscription system on a forum/community site. The range of plugins for forums is amazing so if I could afford amember it would of been my number one choice. Please choose me so I can launch my community forum. i always wanted this but couldn’t buy because of high pricing. i’d love to have this. this could be nice for my new idea. I want to create a backup website for social networks, that people can backup or synchronize their networks. I think i can use aMember for my site to let the users pay for some diskspace the take by creating a backup. Hopefully i win, fingers crossed!! i’ll use it till it breaks! I would use it to organize my work and as an amateur. A nice giveaway. Thanks. I would use it to supplement a community site. Most likely provide “premium” features to users who donate. I’ve never used Amember. I would give it a shot in my next client project. The best part what I found about this tool is usability. Nice color selection and available features made this tool stand apart. We’re busy setting up a SaaS product for brokers. Although we’re starting with sales this week, we haven’t yet setu a solution to manage subscriptions and payments. First time that I hear of aMember. I would use it for a photography hobby site where ideas could be exchanged. Thank I would like to use it to my website where I sell t-shirt to visitor. thank and please count me in! For me aMember has been an indispensable tool, to date I haven’t needed to use it myself but it’s been my go to suggestion for clients. Since 2004 I’ve been working as a freelance web developer and during that time I’ve worked to with clients to build local directories, teaching courses, mastermind groups, hobby societies, the list goes on. I’ve worked on an eclectic collection of niches, from Internet marketing and business mentoring to painting clubs and crochet groups. For any project that handled memberships I recommended aMember because I trust it to do the job right. Now that I’m moving from being a service provider to a product producer, without a doubt I’ll use aMember to manage all of the membership requirements. It’s ability to easily integrate with other systems means that I don’t need to worry about spending excessive amounts of time managing it. I’ve got my own local business meet up society, a cutting-edge web development course and a couple of hobby sites all of which would benefit from membership systems from launch. I heard only good things about amember, I would like to try it on a subscription based site I’m working on. I would use the package to allow the business I work for, to take proper online payments. I work for a drama school, and allowing our students to pay their term fees online, book tickets to upcoming performances etc etc has been something ive been wanting to do for a long time! Currently Ive written a small integrated system that works, but it isn’t nearly as adaptable as i would like it to be, and it would defiantly benefit from a more stable system! I will use this in my company’s upcoming personal projects and clients easiness. !!! Great application, i will use it for my digital product delivery site. Wow! That would be incredible for the eCommerce website I am going to launch in several month! Hi, we are two guys from Italy. To give a hand to fight the financial crisis, we are putting ourselves in business opening a little start-up company, selling what we’ve learned in these years: custom eCommerce Websites and Web Marketing. We’ll use it to manage our customers and payments, and as a test for a resale on the customers’ websites. I am thinking to create a membership site for quite some time. This software would help me get started. That would be nice to have… Great for managing memberships between different 3rd party scrpts. Hi, I am currently helping my local sport center to create a new system to help them manage their members more efficiently, which eventually will allow their users to pay online. Using aMember would be the best solution to solve their problems. I want to use it to sell service from my site. I would love to use it and might be useful as a opportunity for me to set up my own business. thank for giving away this! This would be perfect to use with the charities, non-profits, and arts-based organizations that we deal with. This would even be something we could use to manage growing magazine subscriptions too. I’m excited about this one!! I’d use it with my WordPress site to power a member only area. I’ve been wanting to do that kind of thing for a long time now since there is only a certain amount of money you can make with just advertising. Premium content at a monthly subscription can bring in a lot more money. I would like to build a cloud web panel using aMember. This would save me a lot of time and effort with the payments and subscription system already built-in. I will use the aMember Pro software to build a wordpress theme marketplace like themeforest. I think this will be the best software to manage a marketplace efficiently. Working on a gaming community website, this would greatly benefit it, as it would allow us to set up areas for subscribers, where the money could then go to server maintenance. This is especially important in games that don’t offer their own multiplayer servers. I would use it and do refer to my friends and clients if it suits me the best. Fuuuuuuuu we would use this to make our customer management system work awesomer! I’ve got tons of ideas how this membership software could help us run our website and photography courses more effectively. Discounts on courses, special photography workshops for members, downloads of our ebooks for platinum members, etc..
Hope we get lucky this time! Would love to use aMember Pro to handle membership management and subscription payments for our rapidly expanding local, recreational soccer club for adults. We’re trying to integrate this with a jQuery Mobile front-end. I’m building a SaaS that will allow users to create their own mobile website. It would save me a lot of time using aMember Pro instead of writing something myself. I would use it for a web application for keeping track of local online bill payments, like gas, electricity, water, etc. bills. Management of the subscription of my blog would go best with a powerful system like this. I can also make offers and competition to attract new people. I would like to use it to help our NGO collect memberships! I would use it build out a gaming community site. A new theater group has asked me to help with their technology setup which would include membership/subscription management. It would be great to get that experience with aMember so I could add it to my consulting services and recommend it to my other clients. I am building a website for a martial arts/fitness club(all ages) and I need a way of integrating something to allow members to access an online payment option for monthly memberships. I could also use this to keep track of member newsletters and restricted area content offered to customers of the club. I would love to use this with my WordPress site. This looks like an awesome product! Hello, this would be nice, since we are trying to launch the product. Unyksoft is a software to manage multiple web sites, still in beta, hopping to launch the stable version in 2 month period. So with a software like this, the license management would be so much easy. We need this. I would use this system to for a new writing instructional environment that will be used by two universities. We are working on a special project to keep member profiles/connections. We can use Member Pro for user management and subscription plans instead of develop new module. Wow! This would be incredible – I have a wide array of ways I can think of to use this, but I’d love to use it on several non-profit projects that I have coming up soon that require both subscription and membership management. aMember could be just the answer I need, and there’s nothing better than finding ways to save money for a non-profit organization, so getting it for free would be incredible! I’d use their WordPress integration to make a “Code Academy” type site. As a small web business owner I am always scrambling for funds and resources. I would love to use aMember Pro to handle membership management, subscription payments, etc..
I’ve always wanted something like this, better than my rough self-wrote membership system for my social project. I have a small company here, and we are struggling to keep track of our clients memberships and to acquire new ones. I hope to get this script . it seems to be very good to obtain . Would make a social network with this. I would integrate it with an education online system soon to launch.
. I will use amember pro to restrict access of users to the download pages so just vip users can access downloads .
. I will use this software to define parent access to the child activity pages .
. I will define moderators possibilities . I would use it to move our 15,000 members into one database so I they can up their own information. Without us constantly having to send excel spreadsheets of membership lists around. I would use it to update my company’s existing membership gateway that provides access to digital products. I will integrate this to a custom shopping cart system I am building. I have been looking for something like this for a long time! I do a lot of free work for friends and family that accept donations for their own or other charities. Typically I end up building out a custom shopping carts/ billing systems for each payment gateway API that they need to use. Since their budgets are limited or non-existent, it would be so amazing to have all this plus more at my disposal! It looks very put together and comprehensive. I usually don’t write comments for this kind of stuff, but really.. it would be so nice to get a chance to use something that cuts a big chuck of work out of my schedule. Cool! I would integrate aMember Pro into my latest project called http://inoost.nl This is the place to discover all the nice things to visit in Amsterdam East. With aMember Pro it would be really easy to manage all the different payed subscriptions for the entrepreneurs who are displayed on the website. Pick me. Pick me :) Looks nice, i would be happy to use it. This would be a great piece of software to try for our real estate software. At this time we are looking at Chargify but a free pro membership probably would greatly sway us to this software. I’m already running a subscription based site and would really like to try the amembo, as heard only good things about it. Looks great! Right for my new business! I would use it to create a members only area on my blog to giveaway free scripts and landing pages. If I win… I would like to used for my non-profit website for accepting donation. We would use aMember Pro on a website designed to help non-profits manage their digital presence. Everything from social media monitoring to website design to party invites. We plan to integrate all of our other projects into one site with aMember Pro handling all of our membership manangement! It looks a good membership software. I can use it for my own job. This will help me to build a new client portal. I would love to integrate this with our open source CMS and intranet solutions, to have one centralized, user management solution. I would use aMemberPro to sell my digital product, qith an integration with forum VB (for the support), selling page, blog (WordPress) and with the possibility to offer coupon, giveaway, etc. Great product that I have not been able to afford. There are so many plugins available it would suit many of the projects I would like to create because of amembers versitility for managing products or subscriptions. I would most likely use it to manage subscriptions to my download area of vector art but as I said the product is so versatile I have many ideas. I’ll make a membership site if I win..
Hope I could win this. Is this freebies still running?